Visiting the Demilitarized Zone (aka DMZ) between North and South Korea was quite a bizarre experience. Yet it was one of those bizarre experiences that I would certainly recommend to anyone traveling to Seoul and at all interested in local affairs. 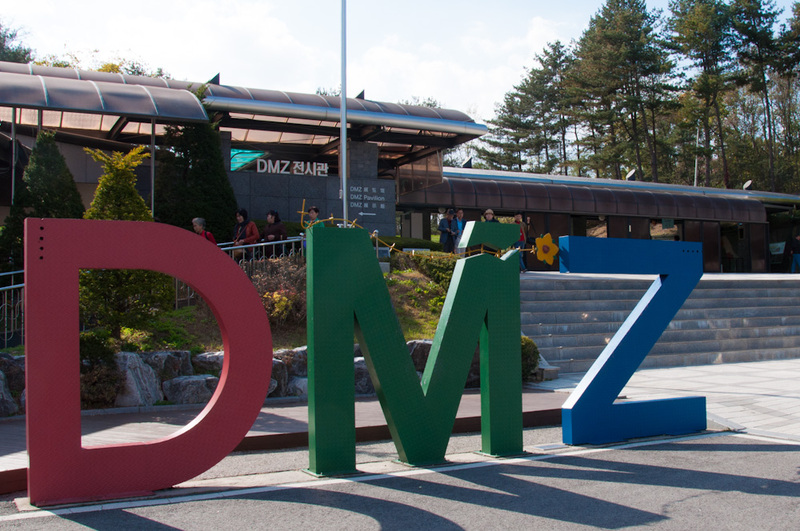 No matter how much you like to travel independently, the DMZ can only be visited as part of an organized tour. 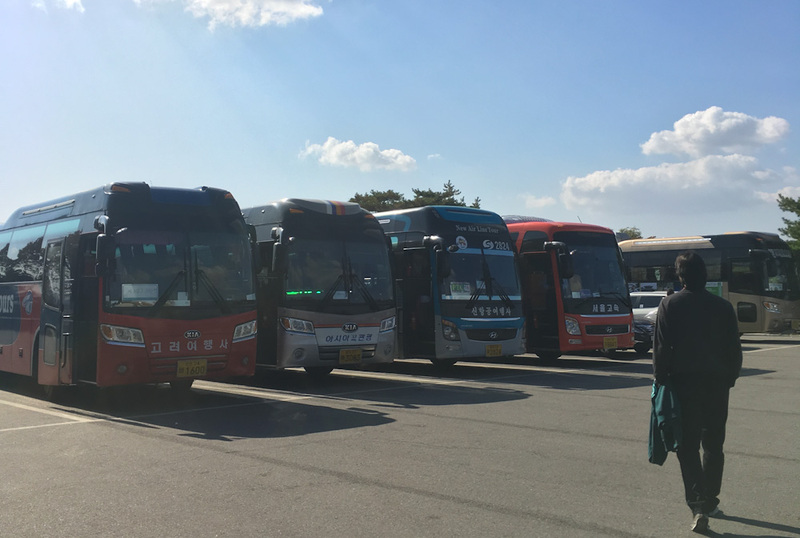 We joined a trip by Panmunjom Travel Centre, departing from Seoul. 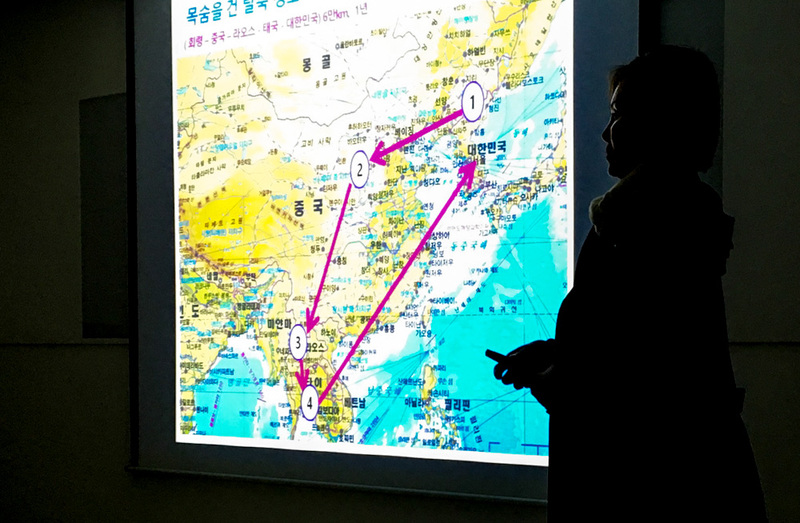 This travel agency organizes several tours that focus on visiting the border between the Democratic People’s Republic of Korea (aka North Korea) and the Republic of Korea (aka South Korea) while trying to understand the ongoing conflict between these two countries. Even though we were keen on visiting not only the DMZ but also the Panmunjom JSA in one of their combined tours, we couldn’t do so due to political and safety reasons. Trump was supposed to visit soon. So as touristic as this area has become, there is an actual war going on and this obviously affects any plans travelers may have for the region. The JSA is the Joint Security Area and it is the most forward area in the DMZ that can be visited by those traveling from the south. It is also at the JSA that travelers get a kick clicking photos inside a joint building where military staff from both North and South Korea stand. This is also where meetings between both countries take place, to discuss agreements. Crossing to the north is technically now allowed, and tour companies will warn you that doing so involves a great risk. On a regular day though, from what I read regarding the experiences of fellow travelers, the atmosphere is serious but not dangerous per se. If it was that unsafe, I’m guessing tour groups wouldn’t be going there on such a regular basis! What we did get to visit during our trip were the Odusan Unification Observatory, the Imjingak Village & Freedom Bridge, the Third Infiltration Tunnel of the DMZ and the Dora Observatory. 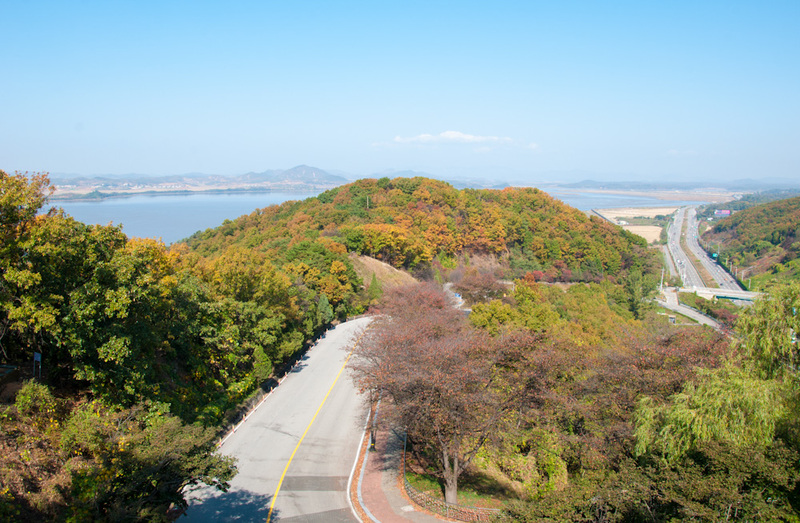 This article covers what our day was like, and also what you can expect when you join one of these very popular DMZ Tours. Like most organized tours, this DMZ trip involved a lot of getting in and out a big bus, along with a group of tourists from all over the place. Right before we departed Seoul, in our meeting place at Koreana Hotel, I was already feeling funky about this trip. 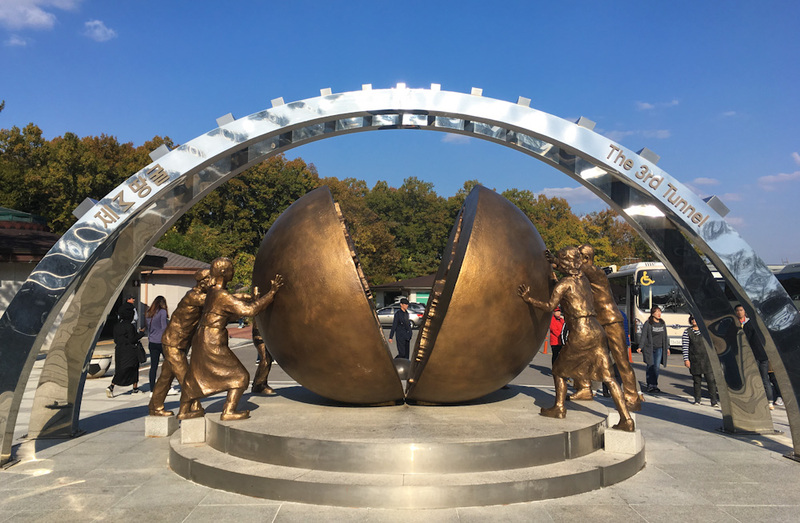 While we waited to depart, a group of American tourists was glancing at a map on the wall, where the points that separate North and South Korea were marked. I overheard a lady in her 50s saying something along the lines of “This is why we need our military to be strong as it is… so that atrocities like this can be avoided all over the world!” My initial reaction was to judge this lady, thinking she was so institutionalized, that she thought US military was making the world a more peaceful place. But, after my initial reaction, I decided to keep an open mind. 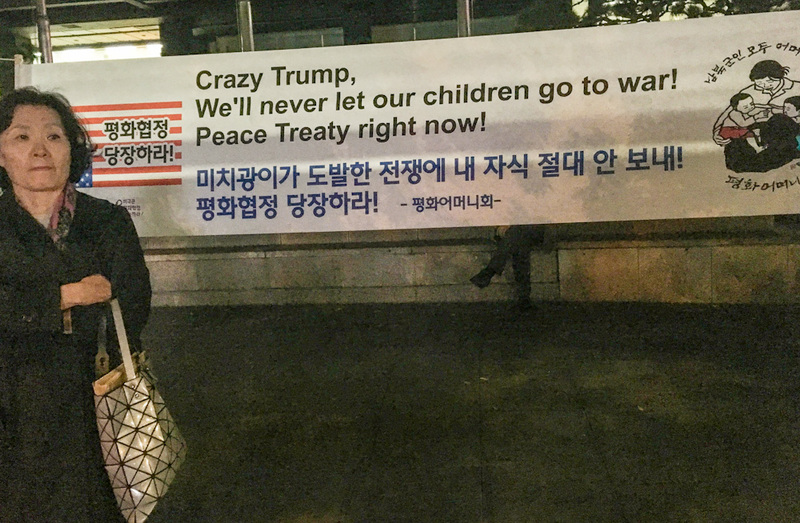 After all, she wasn’t THAT close-minded as not to come travel to Korea at a time when tensions would make many folks cancel their trips, and she even joined this tour… so let’s all keep an open mind and try to learn something today. The first stop of the DMZ Tour took us to the Odusan Unification Observatory. 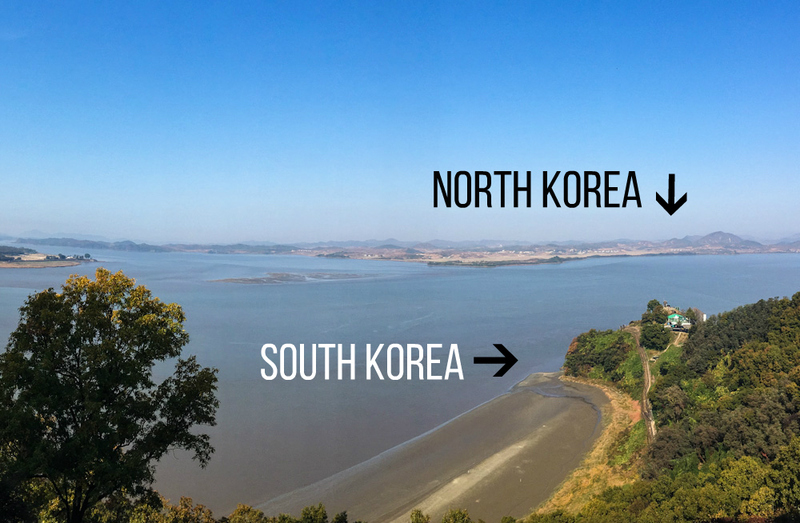 From this observatory’s location, you can clearly understand that the distance that separates North and South Korea is physically very small. There may be great differences in ideology between these two countries, but when it comes to space, there’s only a not that large river to act as separation. Even though geographically both countries are right there, next to each other, you can’t help but notice striking differences between the two. While the South where we were standing was lush and green, the north seemed barren and darker. Our guide talked to us about over cultivation and usage of the land up north. Since North Korea is cut off from pretty much the rest of the world, they have a tendency of using every single thing the land gives them. Sometimes, the rate of usage of these resources is faster than the time it takes for them to be renovated. 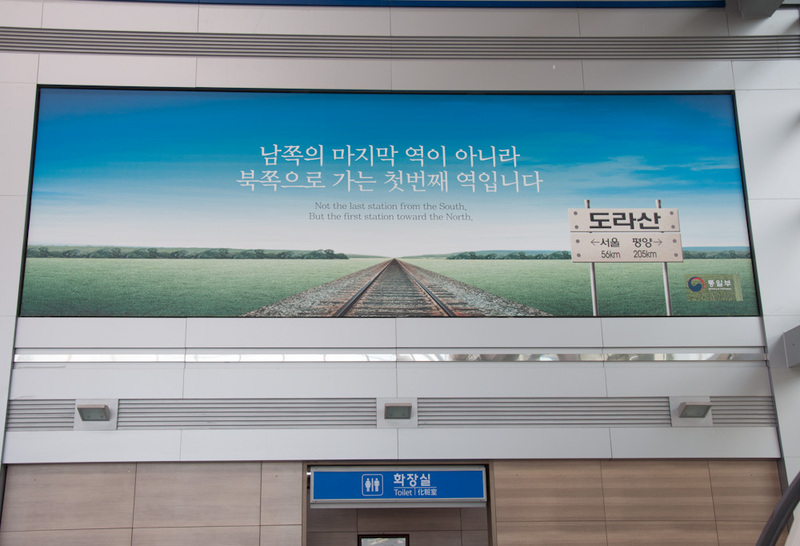 The message our guide tried to share during the entire trip was one of a reunified Korea, where North and South blend into one country again, just like it was about 50 years ago. 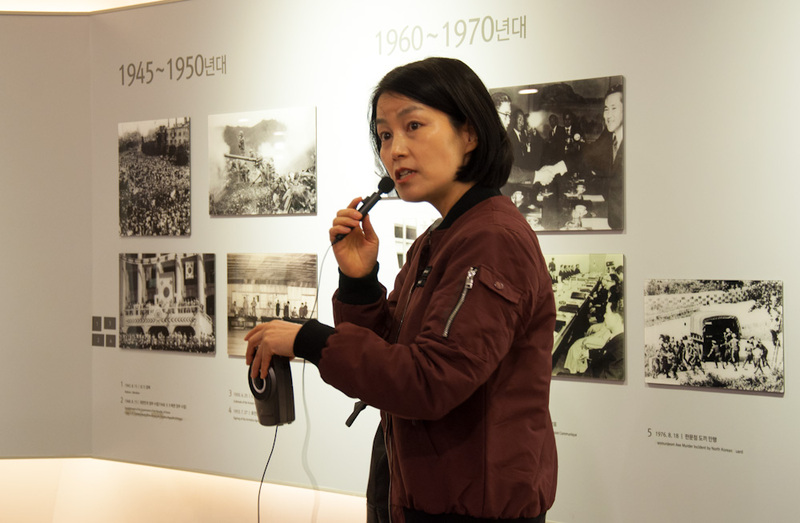 During the visit to the Odusan Unification Observatory, visitors are shown a movie about the history of the division of the Korean Peninsula. You will get some context to better soak in the teachings from the rest of the day. But, if you ask me, I’d recommend taking it all with a pinch of salt and doing some extended reading that will allow you to contrast facts and opinions from different sources. After all, this is a tour that takes place in South Korea and, as such, offers only the perspective from the South. Even though Korea was split into two so that both regions could be self-governing under a system of “their choice”, things never moved on with ease. The DMZ was created in 1953 under the Korean Armistice Agreement. The idea was to mark a border area where no military or hostility acts would occur. While defining the DMZ and this conflict-free border might have made things a little more peaceful [literally] on the surface, tensions didn’t stop. Until today, South Korea claims to have found several infiltration tunnels that are said to connect Pyongyang, the capital of North Korea, to Seoul, the capital of the South. These underground channels would make a possible invasion of the South relatively easy, yet this has never happened. During this tour, we had the possibility of going underground and into what is now known as Third Infiltration Tunnel. The tunnel is open for about a kilometer and a half. Beyond that point, it’s North Korea. 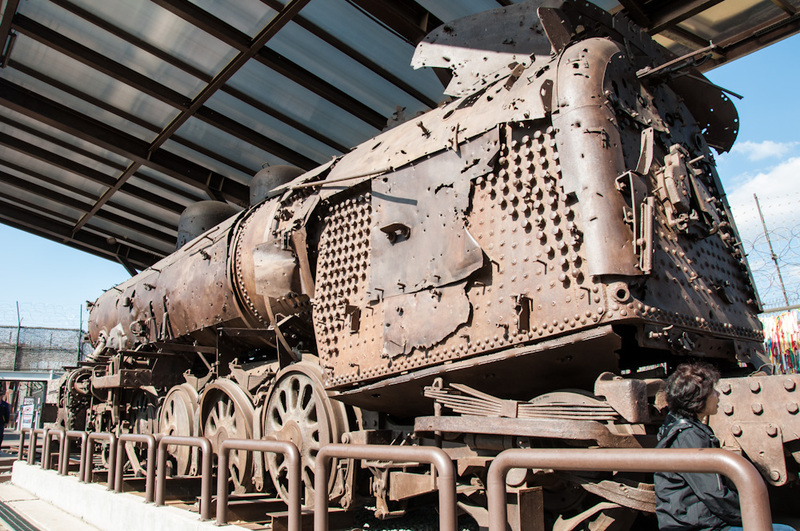 While there is nothing particularly exciting to see inside the tunnel that goes as deep as 73m, you can take the time of this walk to reflect on the tidbits of history that are shared during the tour. 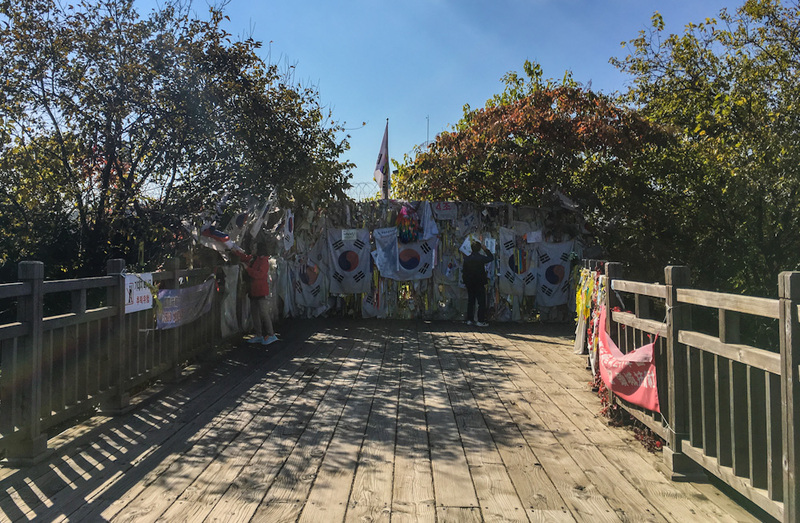 Before visiting the tunnel, you also get to spend some time at the Imjingak Village, which is the last village in South Korea where locals are allowed to go to freely, without any special permission. For obvious reasons, freedom of movement gets tougher as you approach the border, and locals aren’t known to join these type of tours so popular with foreign visitors. Near the so-called Freedom Bridge in Imjingak, where families come to remember their relatives up North. But this hasn’t stopped Imjingak from becoming quite touristic. 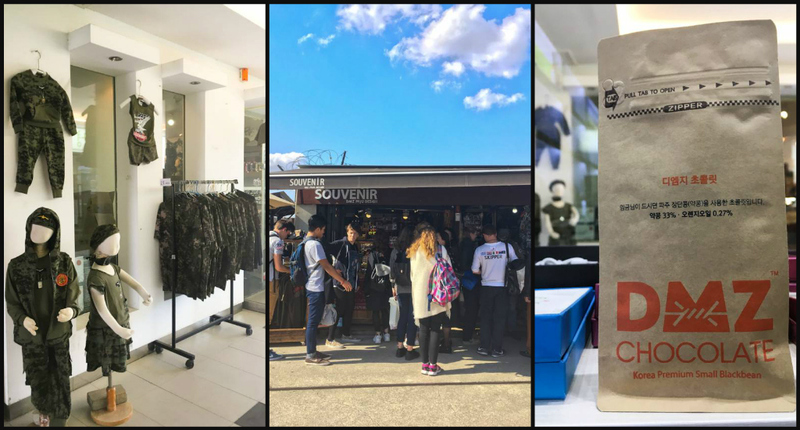 It’s so touristic that not only you’ll find buses full of visitors arriving all day, you’ll see shops selling DMZ themed souvenirs that I personally found borderline inappropriate. 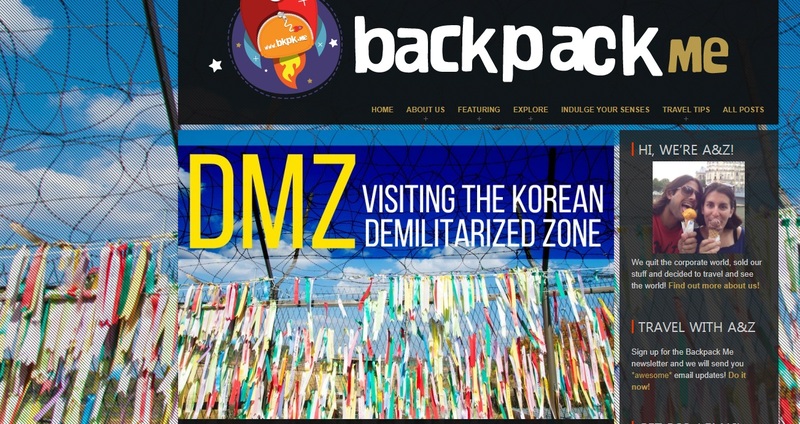 Why would you come to a place where families come to remember the relatives that can no longer be a part of their daily lives because of the separation, and at the same time buy your children a DMZ themed bag of chocolate or a kid-sized military uniform?! What I was indeed excited about during this tour was the possibility of chatting with a “defector”, that is, someone who managed to escape from North Korea and who now lives in the South. Our tour included a Q&A session with a lady who told us everything she went through to eventually live a relatively peaceful life in Seoul. While we could ask anything we wanted and have our guide translate from English to Korean, and back to English for travelers to understand, I did end up feeling like the answers weren’t as in depth as I would have wished. I understand how this lady’s experiences must have been painful though. I asked her that we keep on hearing a lot of negative things about North Korea abroad, and if any of those things are not entirely true or have been blown out of proportion. Her answer was basically that things are worse than what we may imagine internationally, but she didn’t go on to give any specifics to illustrate this. Nonetheless, it was interesting to hear about everything she went through to get to where she is today. Meeting with a North Korean defector – the photo has been darkened to protect her identity. While I am convinced the tour that includes the JSA would have felt more thorough than this one, visiting the DMZ was definitely worth it. The tour guide was knowledgeable and she was open to answer any questions you’d like to ask her. I also appreciated how they kept reinforcing how South Korea would like to see both countries united and peaceful in the future. 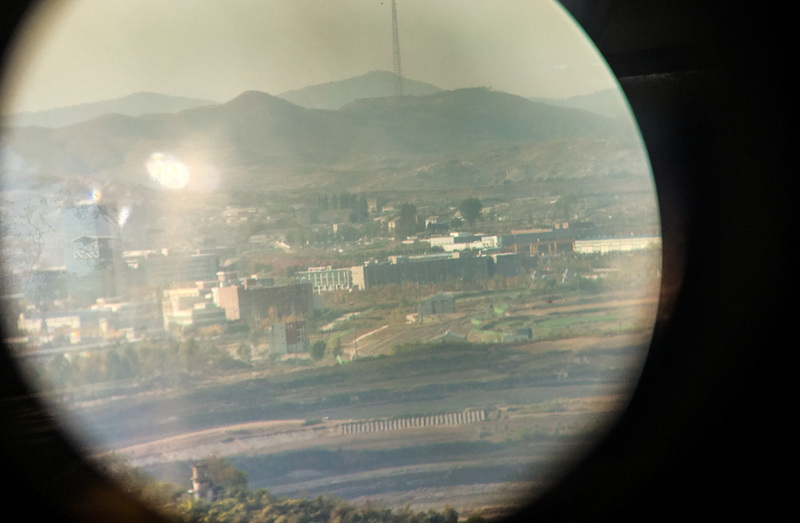 In terms of itinerary, the last stops of the tour took us to a train station that is ready to be operational if the border between both countries opens, and also to the Dora Observatory, from where you get to see and listen to what’s happening in North Korea. Apart from some propaganda broadcasted to a few people who can be spotted working the land, there’s not much else going on. Believe me, this adds to the peculiar feeling you get visiting this area. Inside of the "last" train station in South Korea. If North and South Korean borders were open, the Korean Peninsula could potentially be connected all the way to Europe by land. You can use the coin-operated telescopes at the Dora Observatory. This is what you get to see. One thing is for sure: this tour and our entire trip to South Korea made us really want to visit North Korea too. For now, we rejoice browsing the captivating images by Polish photographer Michał Huniewicz, who visited North Korea and decided to ignore a lot of rules in order to show us all a glimpse of what life is like in a country I feel we hear so much of, but know so little about. It’s not possible to visit the DMZ independently. You know we would have done it this way if it was possible! You must always join an organized tour. Our trip was arranged by Panmunjom Travel Center in Seoul (ptcjsa@gmail.com). This company offers several tours of the border between North and South Korea, combining different “attractions”. Programs and prices can be found here.